The two basic methods used for learning attitude instrument flying are “control and performance” and “primary and supporting.” Both methods utilize the same instruments and responses for attitude control. They differ in their reliance on the attitude indicator and interpretation of other instruments. Aircraft performance is achieved by controlling the aircraft attitude and power. Aircraft attitude is the relationship of both the aircraft’s pitch and roll axes in relation to the Earth’s horizon. An aircraft is flown in instrument flight by controlling the attitude and power, as necessary, to produce both controlled and stabilized flight without reference to a visible horizon. This overall process is known as the control and performance method of attitude instrument flying. Starting with basic instrument maneuvers, this process can be applied through the use of control, performance, and navigation instruments resulting in a smooth flight from takeoff to landing. The navigation instruments indicate the position of the aircraft in relation to a selected navigation facility or fix. 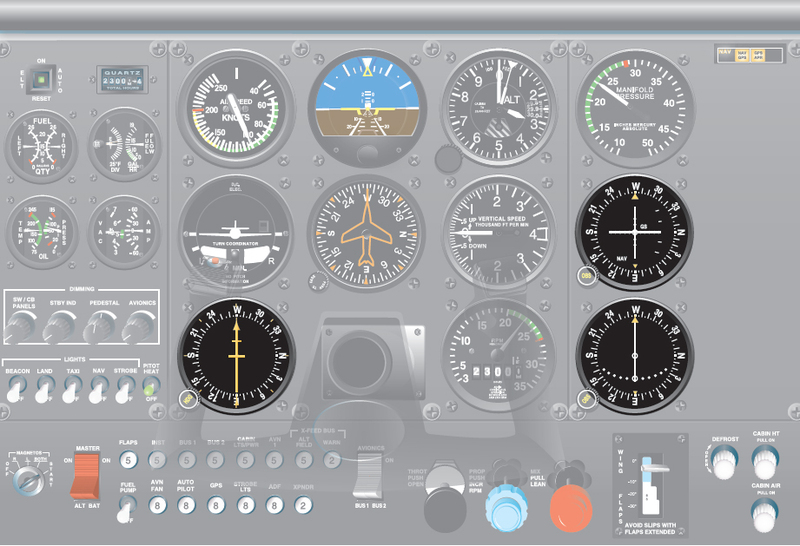 This group of instruments includes various types of course indicators, range indicators, glideslope indicators, and bearing pointers. [Figure 6-3] Newer aircraft with more technologically advanced instrumentation provide blended information, giving the pilot more accurate positional information. Establish an attitude and power setting on the control instruments that results in the desired performance. Known or computed attitude changes and approximated power settings helps to reduce the pilot’s workload. Trim (fine tune the control forces) until control pressures are neutralized. Trimming for hands-off flight is essential for smooth, precise aircraft control. It allows a pilot to attend to other flight deck duties with minimum deviation from the desired attitude. Cross-check the performance instruments to determine if the established attitude or power setting is providing the desired performance. The cross-check involves both seeing and interpreting. If a deviation is noted, determine the magnitude and direction of adjustment required to achieve the desired performance. Adjust the attitude and/or power setting on the control instruments as necessary. Proper control of aircraft attitude is the result of proper use of the attitude indicator, knowledge of when to change the attitude, and then smoothly changing the attitude a precise amount. The attitude reference provides an immediate, direct, and corresponding indication of any change in aircraft pitch or bank attitude. Changing the “pitch attitude” of the miniature aircraft or fuselage dot by precise amounts in relation to the horizon makes pitch changes. These changes are measured in degrees, or fractions thereof, or bar widths depending upon the type of attitude reference. The amount of deviation from the desired performance determines the magnitude of the correction. Bank changes are made by changing the “bank attitude” or bank pointers by precise amounts in relation to the bank scale. The bank scale is normally graduated at 0°, 10°, 20°, 30°, 60°, and 90° and is located at the top or bottom of the attitude reference. Bank angle use normally approximates the degrees to turn, not to exceed 30°. Proper power control results from the ability to smoothly establish or maintain desired airspeeds in coordination with attitude changes. Power changes are made by throttle adjustments and reference to the power indicators. Power indicators are not affected by such factors as turbulence, improper trim, or inadvertent control pressures. Therefore, in most aircraft little attention is required to ensure the power setting remains constant. Experience in an aircraft teaches a pilot approximately how far to move the throttle to change the power a given amount. Power changes are made primarily by throttle movement, followed by an indicator cross-check to establish a more precise setting. The key is to avoid fixating on the indicators while setting the power. Knowledge of approximate power settings for various flight configurations helps the pilot avoid overcontrolling power.